The river Gomti will get additional water as the UP state government has approved linking the river with a canal of the river Sharda in Pilibhit. The linking work, under the Gomti revival project by the state irrigation department, began this week. 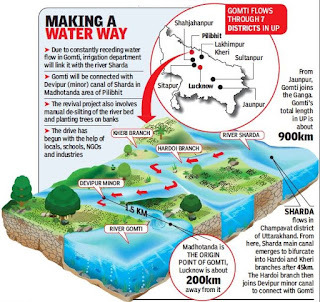 While the Gomti’s flow has been on the decline because of continuous silting and pollutants, river Sharda is relatively healthy, providing water to several irrigation projects in UP. 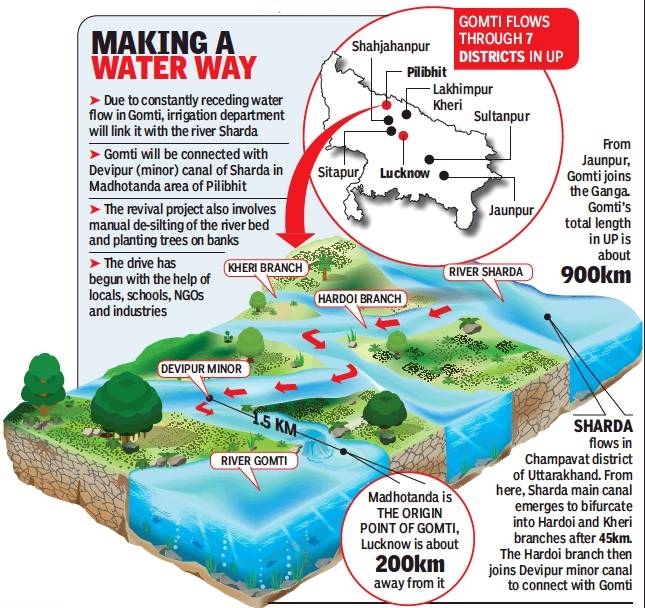 Under the canal linking project, the Gomti will be connected with Devipur (minor) canal of river Sharda in Madhotanda area of Pilibhit. It is about 2 km from the Gomti, and when connected, can yield about 10-15 cusec water daily into the river. This would be of great help in the upstream area of the Gomti where the river has reportedly been drying due to excessive desilting. Irrigation officials said that the Gomti’s total 900 km length will be revived from Pilibhit to Jaunpur in phases and the exercise will be completed by this year-end. The first phase will cover the stretch from Pilibhit to Lakhimpur and is expected to be completed before the arrival of monsoon. Superintending engineer in the irrigation department in Bareilly AK Sengar said, “A special initiative under the revival project is desilting, where we have asked for support from people, NGOs, industries, schoolchildren and labourers under the Mahatma Gandhi National Rural Employment Act . This will help in manual desilting of the riverbed from Pilibhit to Lakhimpur Kheri.” The irrigation team, along with people’s participation, will desilt around 45 km of the Gomti till Lakhimpur Kheri in the first phase. Officials said people’s participation would also be sought in the plantation drive along the Gomti’s banks. Everyday, millions of litres of untreated waste flows into the river, making it extremely polluted. The treated water does not meet the general standards for discharge according to the Water (Prevention and Control of Pollution) Act, 1974. This has affected the internal eco-system of the river, leading to a fall in its aquatic quality and making it unsuitable for secondary purposes like bathing or washing clothes.